If youʼre committed to your fitness goals, you might have a love-hate relationship with the Christmas season. On the one hand, itʼs an exciting time for young and old alike – friends and family gather around the Christmas tree, unwrapping presents and feasting on turkey, pavlova, and eggnog. On the other hand, these celebrations entail excessive calories and lack of movement, the result often being more flab around the midsection. In fact, research shows that the average adult gains half a kilo between mid-November and mid-January. While it may seem like a tiny amount, the problem is that most people donʼt lose this weight. Thereby, the Christmas season is the period that contributes the most to weight gain. Fortunately, there are a lot of things you can do to prevent your hard work from going down the drain. Below you will find eleven evidence-based tips for having a blast around Christmas while remaining on track with your fitness goals. The gym is either closed or the hours are cut short, but don't let that stop you from moving during the holidays – you need a workout now more than ever! The combination of watching sports and gorging yourself on turkey and eggnog sets you up for weight gain. By staying active, you will burn some of the extra calories youʼve consumed. A simple activity such as a family walk is a good option. It offsets some of the extra energy you ate. Besides, it aids digestion and provides quality time with family and friends. One of the best things you can do to prevent your Christmas meal from becoming unwanted fat is doing a glycogen depletion workout beforehand. A glycogen depletion workout is based on a high training volume (reps and sets) with short rest between sets (e.g. 30-90 seconds) and mainly compound exercises (e.g. squats, lunges, rows, and presses). Such a workout, as the name suggests, reduces your glycogen stores. As a result, the carbs you consume are more likely to find their way to your muscle and liver cells instead of your fat mass. 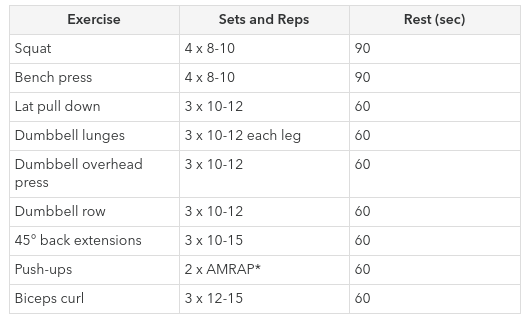 Here is an example of a glycogen depletion workout you can do before your Christmas feast. To do a glycogen depletion workout right, you have to push every set till one rep before failure. Therefore, such a workout isnʼt for the faint-hearted, but itʼs so worth it! Getting enough sleep is crucial for your health and figure. 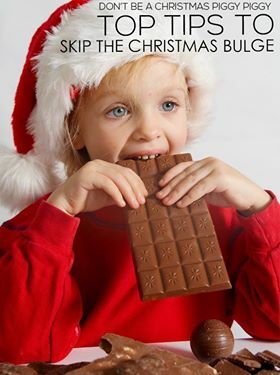 This is especially true when it comes to preventing Christmas-related weight gain. Why? Because sleep deprivation increases food consumption. This happens without you even being conscious of it. Researchers found that just one less hour of sleep can up your food intake by as much as 45%. This is because sleep deprivation lowers the satiating hormone leptin while raising the hunger hormone ghrelin. Before you take your seat at the dinner table, have a glass of water. It will help control your energy intake. Research involving obese elderly people found that when they drank 500ml of water thirty minutes before breakfast, they consumed on average 13% fewer calories, unconsciously. Christmas is about spending quality time with friends and family, right? However, one in four are glued to the TV while having their Christmas feast, according to a poll by RadioTimes.com. This can not only make you miss out on meaningful conversations with your loved ones, but it can also significantly boost your calorie intake. One way to instantly slash your calorie intake and thus prevent weight gain is by practicing mindful eating. Mindful eating means you bring your full attention to the experience of eating. This includes your emotions, satiety, smell, taste, visual impact, and your company. When your belly fills with that turkey and gravy, receptors that signal your stomach is full get triggered. This, in turn, causes a release of satiety hormones – the mostimportant ones being ghrelin, peptide YY, GLP-1, and cholecystokinin. Great, because this makes you feel full, and when that feeling becomes strong enough, youʼll put the fork down. But hereʼs the problem: the process of releasing those hormones takes an average of twenty minutes. So, if you quickly wolf down large amounts of food, your brain doesnʼt have enough time to tell youʼre full. This might cause you to consume plenty of extra calories. The solution? Slow down and chew each bite more often. Researchers found that those who chewed a piece of pork 15 times before swallowing ate on average 11.9% more calories than those who chewed 40 times. So put the fork down between bites and chew each piece of food numerous times before swallowing. One of the easiest and tastiest ways to prevent gaining excess weight during the Christmas season is by increasing your protein intake. This might sound counterintuitive – after all, protein contains calories – but it works. Why? Because protein is highly satiating. If you raise your protein consumption, you will automatically consume fewer calories in total. One study published in The American Journal of Clinical Nutrition shows this clearly. In it, researchers increased the protein intake of the participants from 15% to 30% of their daily calorie intake. As a result, the subjects unconsciously consumed, on average, 441 fewer calories per day. This led to an average weight loss of 11 pounds in just 12 weeks without any other conscious changes to their diet. During the Christmas season, alcohol, soda, and other sweetened drinks are always at hand. The problem is that these beverages contain a large amount of sugar and empty calories. Combine this with the fact that liquid calories are ineffective at satiating hunger – calories from alcohol even increase appetite – and it is clear why those drinks often lead to excess flab around the midsection. Even though Christmas is a time to enjoy, controlling your intake of liquid calories will help you keep off unwanted kilos. If you're looking for a simple trick to automatically drop your energy intake, hereʼs one: eat from a smaller plate. The reason is that people automatically put more food on a larger plate than on a smaller one. Therefore, a smaller plate reduces your food consumption and gives you the perception you ate more. And if you want another way to trick your mind into eating less, then pay attention to your cutlery as well. Interestingly, scientists found that eating with a bigger fork helps you consume fewer calories. At Christmas, it is tempting to reach for the high-calorie dishes. However, if you want to maintain your figure during the festive season, donʼt skip the fruits and veggies. They have a low energy density (calories per gram), an abundance of fibre, and a high water content. Thereby, they deliver satiety with only a small number of calories. So, instead of going for another round of the mince pie, do your figure a favour and reach for a bowl of mixed fruits. You go to your Christmas dinner with the intention of keeping your energy intake in check. A few hours later, your belly is about to burst from the turkey and eggnog, which made you exceed your limit by thousands of calories. Now what? Well, as an emergency option, fasting can be a great way to get your energy balance back in check. After your feast, skip a few of the meals you would normally consume afterwards, such as breakfast and lunch the next day. Then, after your fast, continue to eat normally, consuming the same amount of food as before fasting. During Christmas, youʼre bombarded by high-calorie foods that can wreak havoc on your body shape and health. And when you've spent a fair time dieting, your neurotransmitters start to change, which makes your brain screaming “EAT, EAT, EAT,” especially when an almost unlimited amount of food is available. A common consequence is an all-out binge that sets you back thousands of extra calories. You must avoid this! It is crucial that you go into your Christmas meal with set limits and that you promise yourself you'll stick to them. Far too often people approach holiday season with an "I'll start tomorrow" mentality. Most often, tomorrow never happens, and they get stuck in a vicious cycle of unhealthy habits. While a small slip-up or two won't ruin your progress, people often abandon their goals when they get stuck in this vicious cycle. So, enjoy the time with your loved ones, consuming tasty foods together, but also know when it's time to put the fork down.